Hot Springs, Virginia is one of my favorite places to document a wedding. The Homestead resort and it’s rustic charm, stunning views, and premier service offer us magical evenings and wonderful experiences. Personally, we have spent many Easter weekends at The Homestead with my paternal grandparents who have made the annual visit from the early 1950s on. Andrea and Eric’s wedding weekend was no exception. This particular image was taken during the “getting ready” phase of the day, which is one of the most intimate parts of the day for a photographer. It’s also relaxing when the ladies can enjoy the experience at the spa. 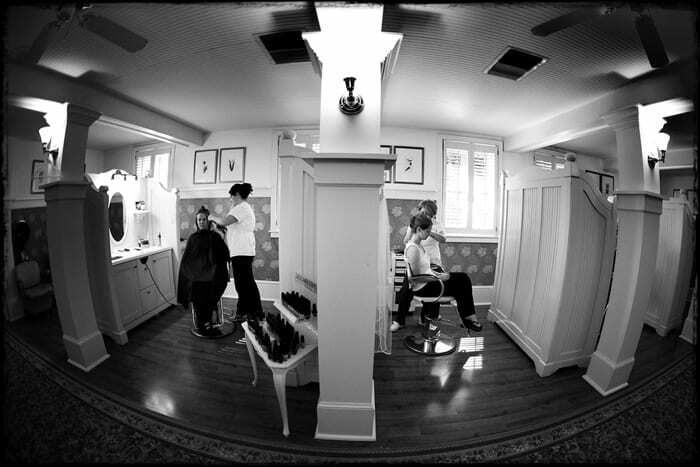 Our image of the week captures a relaxing moment for the bride and her matron of honor captured through my Canon 15mm fish-eye lens for a wide angle of view.